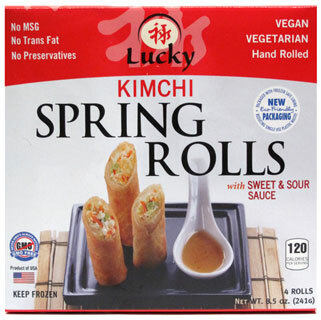 Lucky Foods puts a healthy twist on the best of traditional Asian cuisine to bring you these amazing Kimchi Spring Rolls! Made only from the highest quality ingredients, these Kimchi Spring Rolls are delicately hand rolled, and are fully cooked, making them ready to heat and serve. Included is a packet of sweet & sour sauce that complements these Kimchi Spring Rolls perfectly, giving you a healthy and animal-free way to enjoy authentic Asian cuisine without the cruelty! 8.5 oz. (241g) package contains 4 large Kimchi Spring Rolls and sauce packet. $7.29 per package. From Richard Rankin of Kirksville, Missouri on 5/2/2018 . The egg rolls were very tasty. The kimchi definitely came through. I liked them better with a little sriracha than the sauce packet.